One of Scotland’s finest fiddle players, Charlie McKerron won the Daily Record Golden Fiddle Award. 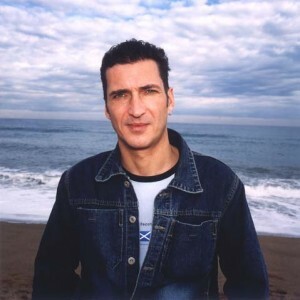 He first joined Capercaillie in 1985 and has toured extensively throughout the world with the band. An accomplished composer Charlie’s music has been widely recorded and he has contributed to the film “Rob Roy” and more recently “Four Men and a Malt” and “Gruth is Uachdar” (Crowdie and Cream) which he co-wrote with Donald Shaw for which they received 2 RTS awards. Charlie also co-produced the album “Big Sky” which involved some of Scotland’s top contemporary Celtic musicians. Having been brought up with traditional fiddle music Charlie has started his own record label (RAJ Records) and mobile recording studio to concentrate on more fiddle based projects. In the past couple of years he has been recording various artists for their own releases and Charlie’s latest project Session A9 have released the album “What Road?” to great critical acclaim. He hopes to be able to release his own album in the near future when he can get time between other recording/composition projects. Session A9 released another album in 2005. Charlie can also been seen performing with Marc Clements, Finlay MacDonald Band, Maggie MacInnes and has been involved in projects with Kevin MacKenzie and Aidan O’Rourke.